Finding it difficult to make important aged care financial decisions on your own? Get help from a nursing home financial planner. The process of moving a loved one into a nursing home will always take a toll on most families. Having to plan everything on your own will understandably leave you stressed out. Don’t let yourself get overwhelmed with all the nitty gritties of aged care when help is readily available. Nursing home financial planning gets easier with the help of an experienced professional. They will ensure your family is in good hands throughout the process. Why Do You Need A Nursing Home Financial Planner? A financial planner who specialises in nursing home advice will handle all your finance and wealth concerns as you focus on giving your parent the best care possible. Getting aged care financial advice before you make any important decisions will save you from making mistakes and paying unnecessary fees as a result of lack of information. 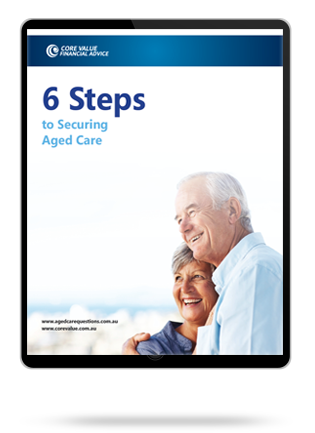 Trying to handle everything by yourself could in fact lead to a more expensive aged care experience for your family. Save yourself the trouble and start working with a financial expert today. An expert nursing home financial planner will assess your financial situation and provide you with solutions to suit your personal needs. With these strategies, you could save a significant amount of money and also be able to take advantage of any available benefits. Wondering whether or not to sell the family home? Or should you take advantage of Centrelink payments to offset some of the nursing home fees involved? Let your financial planner handle that. They will help you understand all the costs and fees involved in nursing home care and advise you on how to preserve the family’s existing wealth. At Core Value, we are specialised nursing home financial planners. We have proven experience in providing our clients with exactly what they need to ensure their loved ones receive the care they need while preserving their wealth as much as possible. We focus on your unique individual needs to create custom financial planning strategies just for you. These strategies ensure that your family receives all the benefits available and help you save on unnecessary costs and fees. On average, we improve our client’s finances by $5,000 per year. We’ve helped hundreds of people in Australia transition their loved ones into a nursing home with relative ease while saving them much needed dollars! Looking for nursing home financial planners in Sydney? Looking for nursing home financial planners in Melbourne? Looking for nursing home financial planners on the Gold Coast? Want to learn more about our nursing home financial planning services? Give us a call on 1300 944 011 to schedule a free consultation with an expert financial adviser for aged care.